Maximum Draft for Transiting The Martin Garcia Channel - CHADWICK WEIR NAVEGACION S.A.
By our Circular ROU/01/16 dated May 26, 2016, we noticed about some draft restrictions when transiting the Martín García Channel (access to Nueva Palmira port). 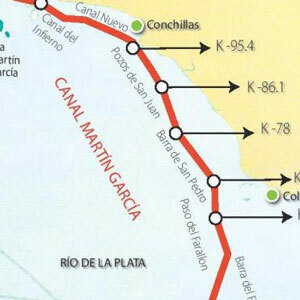 The Pilots’ Office of the Navy has circulated now a note to the Shipping Association indicating that the maximum suggested draft for that channel is 9,45mts (31ft). Further notices will follow once the bathymetry maintenance of the channel is continued. Copy of Pilots’ Office note (in Spanish language), dated June 28th, 2017, is attached hereto. This circular ROU/06/17 withdraws our previous one ROU/01/16 in same regard. It is suggested that Members are informed of this situation, which could affect their vessels trading in the area.